Parallel fences can be more difficult to jump than other types of fences as they provide a different set of challenges for the horse and rider. Adapting regular jumping practices to suit the type of jump, will help to ensure that the horse can undertake the fence successfully. 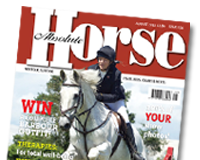 CHeck out our September edition for how to ride a parallel successfully.